The images you see in the banner across the top of the page are by some of Canada’s most famous artists. Go here for more information. I’m a Canadian and I’m a junkie for the visual arts. The site features painting, photography, illustration and other visual arts from Canada, and from around the world. This work by Emily Carr, a favourite, is the quintessential example of art that many Canadians grew up with. We saw the Group of Seven in schools and public buildings. But there wasn’t much focus on other movements. Today, the selection goes well beyond Canada’s still-beloved Group of Seven. And just keep browsing here for some of the fascinating global art we also feature. About Me: I’m a journalist, traveler and art & music lover. I grew up in Canada, trained in Chicago, lived/worked in the Toronto area and now reside in Collingwood, the beautiful centre of south Georgian Bay. 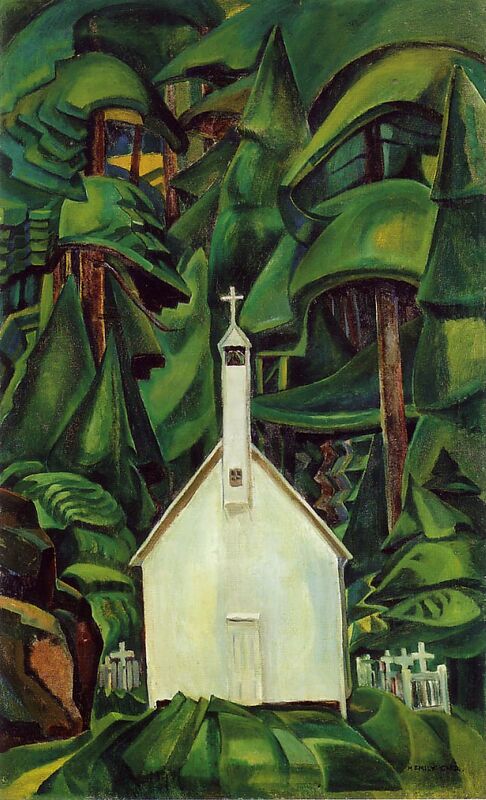 *Re Emily Carr’s painting, originally titled Indian Church (as in the cutline above). In May, 2018, the Art Gallery of Ontario, which holds the piece, re-hung the painting with a new name because the word “Indian” causes pain, the AGO said. The new name Church at Yuquot Village references the British Columbia Indigenous community where the church was located. A CBC piece about the name change is here. This painting by Emily Carr is currently on view in the Musée D’Orsay, Paris where I first heard about the Group of Seven. The exhibition also includes Isolation Peak another powerful painting from Lawren Harris from this group. Lucky lady, to see it there! She was not technically a member of the Group of Seven, but associated with them and definitely part of that style of painting. Lawren Harris, on the other hand, is often considered the centrifugal force of the group. Powerful is exactly the right word. Thank you for the info. I did not know there was an exhibition in Paris. It’s a great exhibition… runs until June. It has a section on Canadian artists and thence my introduction to the Group of Seven. I am going to look forward to following this blog. It will be wonderful to leave the art of writing and take in some visual art as a break in my blogging experience! Thank you for stopping by and glad to meet you. Glad you’re taking a break! I just stumbled upon your outstanding blog! Thanks for sharing. My name is Katrina Lee and I am a Montreal based photographer. I’m having my first solo exhibition, Panta rhei’ in Toronto and would like to invite you and your followers to the opening reception on May 9, QSQ gallery, 845 College St. Toronto 630pm-930pm. The exhibition showcases a new series of photographs focusing on the waters of Iceland. I hope I have peeked your interest. If so, do read more about it on our press release which can be found on my website, leeworkstudio.com, . By chance could you also add something about the exhibition on your blog, FB, Pinterest etc. I’d be honored and would appreciate it very much. Do not hesitate to contact me if you would like further information or images.